There are three possible types of “workpiece”. Firstly, If the diameter of the bar needed to make the required component can be fitted through the spindle of the lathe then the workpiece can be made from the end of a long bar. The bar is held in a chuck. The workpiece is machined on the end of the bar and is then parted off. Secondly, the workpiece is a piece of metal that has been sawn off a bar. This would be slightly longer than the finished workpiece. This might be done because the diameter of the bar that would be needed to make the final workpiece is too big to fit through the spindle. A variation on this is where one end of a workpiece has already been machined, possibly as the end of a bar, and it is now just the other end that has to be machined. Thirdly, the workpiece is a casting. Sometimes it is useful to use hex bar as the feedstock. The easiest way to hold this is by using a three jaw chuck. But usually means it will not be perfectly concentric but often the error is acceptable. Of course it is possible to get collets for holding hex bar but they are never the right size for the bar that has to be held. If 5c type collets are being used it is quite easy to get collets that will take square or hexagonal sections. One way of doing this would be to make a round sleeve which only just takes the hex bar. The outside fit a standard collet. But, for it to work, it is necessary to slit the sleeve along one side. But, in use, care must be taken so the edge of the hex bar does not fit into the slit. Invariably it is essential that all the turned surfaces on the workpiece are concentric. This is a common requirement when turning a small number of parts. But when using a capstan and making a large number of parts it is essential that this can be done quickly and, preferably, automatically. This can be achieved in two different ways. Firstly the workpiece can be held in a chuck that is accurate enough for the bar to be seen as being concentric. Secondly we can assume that the bar is not concentric and machine all of the surfaces so they are all concentric. Related this problem is the quality of the finish of the bar being used. This affects the ways it can be held but it also affects whether the surface has an acceptable finish for the final product. In all of these cases it must be remembered that in industry many exotic ways of holding workpieces are economically possible. In particular the holding action might be done using pneumatically operated chucks and feed systems. What is described here is what is possibly practical for the amateur. This is always available. It is very quick to use. It will work on bars that have poor finish or size. But the accuracy of these is limited. The axis of rotation of a perfectly round bar will seldom, if ever, coincide with the axis of rotation of the spindle. The result of using this is that the workpiece will be slightly off center. Very often when using the capstan the parts being made might be quite small. Any error will be disproportionately greater. It would be possible to skim the part of the bar being used to not only bring it down to the required size but to make this part of it concentric. To sum up, this can work but the workpiece will have to be machined all over. This can be setup so that the workpiece is concentric but it takes far too long to be practical when used like this. Though see later. Many lathes can be fitted with collet chucks. Often these can be very expensive. 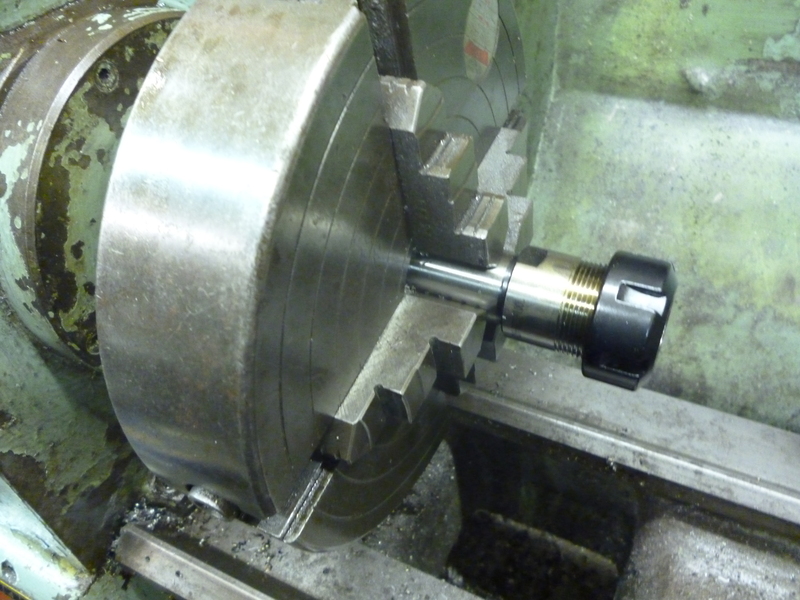 In this method a four jaw chuck is used to hold a collet chuck. The point of the four jaw chuck is that it can be used to hold the collet chuck very accurately centered. This centering only needs to be done once. In industry it was often the case that large numbers of casting would have to be machined. Usually these would required jigs to be made specially to hold such castings. For the amateur this situation seldom arises. Castings are expensive. But, of course, the scale is different. This can mean that a casting used to make, say, a piston, in industry can be made from a bar when making a model. If the starting point is a casting it is often an irregular shape. In this case one possible solution is to make a jig specially to hold this. This is a lot of work. The nearest device that could be used is the four jaw chuck. If the same two jaws are always used when changing the work piece it might work so long as the fixed jaws are truly fixed. The two jaws that are being moved can be marked by putting some insulating tape between them. Often the existing jaws are not quite what is needed. The next step is to use a faceplate. It is fitted with jaws that are bigger or jaws that are designed specially to fit a particular workpiece. It is not possible to rely on moving the jaws to hold the workpiece tightly. One or more of the jaws will need some sort of screw mechanism to hold the workpiece adequately. In terms of time taken to change from one piece of stock material to a new piece and the cost of wasted bits each time one piece of stock material is replaced by another, it is desirable to use the longest piece of stock practical. On the other hand long pieces of material cannot be sent through the post. Storing long pieces can be inconvenient. Suppliers who supply small amounts will often only supply even metre lengths as special orders. Many people will not have that much space to the left of the headstock on their lathe. There must have been more than one person who has drilled a hole in a wall to solve this problem. Very often the parts being made can be of a very small diameter. If a long piece of this is just left to hang out of the back of the spindle it can easily get out of control. The solution is to feed it into the spindle using a tube. It also helps if the free end of the feed is pushed or pulled one way or another automatically. This can be done by having a slot done the side of the containing tube. There is a cap that fits the free end of the feedstock and a cord that pulls the cap, and, hence the feedstock, towards the chuck. This would only take the end of the feedstock to the left end of the spindle so a bar is fitted to the cap. The end of this bar is now pulled. The feedstock can be pulled either by a spring or by a weight. The force applied must be just enough to ensure that the bar always butts up against the workstop decisively when needed. The containing tube also has a slot along the top so a small lever fitted to the bar can pull it back as required. The pushrod can be fitted with a cap. This cap has a hole to fit the workpiece so it does not slip off the workpiece.